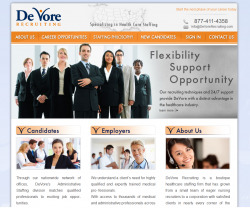 De Vore Recruiting is a Health Care employment recruiting company with a slightly different approach to job placement. Rather than reaching out to active job seekers, De Vore Recruiting primarily assists passive job seekers find a better match in the Health Care Staffing field. 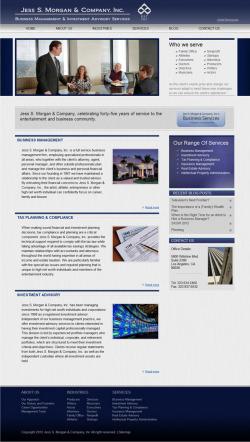 JSMCO.com (Jess S. Morgan & Company, Inc) wanted to restructure and redesign its site at the same time as examining its content menu with regards to what should be transferred to the new architecture. ExtendCredit.com is a leading nationwide provider of online, simple-to-use in-house financing software which automates the entire life cycle of credit management and ensures collections. ExtendCredit.com simplifies, for medical, dental and veterinary practices, and small businesses, the process of extending payment terms to their customers, thereby trimming their labor costs, minimizing the risks associated with self-financing, and implementing faster and more secure ACH payment processing solutions. Qualityscrubs leading online retailer of uniform for medical industry consolidate e-commerce operations with implementation Adrecom e-commerce portal for of multiple storefronts.